I have had a few requests after Christmas for my Pistachio Cookie recipe that I make every year. Believe it or not, I do have it buried on my website www.floracaputo.com but I decided to post it here for all to access. This recipe was a cookie I made when my sister and I were very young and still learning to cook with my mother. They were absolutely delicious and for years I wanted to make them again, and my mother lost the recipe! After years of searching, I found a similar recipe that I tweaked to achieve that delicious cookie of my youth. Enjoy! Preheat oven to 375º. Lightly grease cookie sheets. Sift together the flour, baking powder and salt, set aside. In a medium bowl, cream together butter and sugar. Add the eggs, milk and vanilla, stirring after each addition. Add the dry ingredients and mix until stiff dough forms. Separate a 1/4 of the dough from the rest and set aside in a small bowl. Add the nuts to the dough in the small bowl. Add the pudding mix and the cup of chocolate chips to the large portion of dough; mix until blended. Roll the pudding flavored dough into walnut sized balls, and place 1 1/2 inch apart on the prepared cookie sheets. Flatten the balls using your hand or the bottom of a glass dipped in sugar. Roll the nut dough from the small bowl into marble sized balls, place 1 ball on top of each of the flattened cookies. 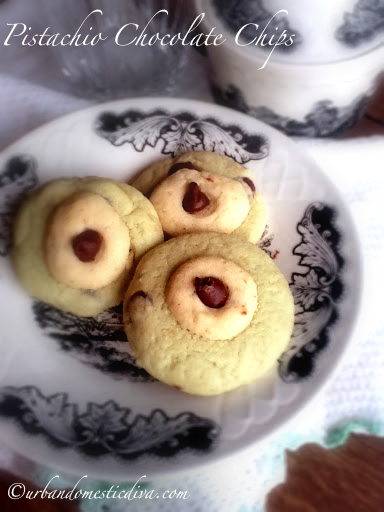 Then, on top of each cookie, on the lighter dough, place one chocolate chip on each marble dollop (nestle it in firmly). Bake for 8-10 minutes, in the preheated oven, or until cookies are set. Remove from the baking sheet to cool on a wire rack. Makes 5 dozen.